The PADI Open Water Diver course is ideal for those who want to take their scuba skills to the next level. With this certification, you'll be able to dive up to 18 meters/60 feet anywhere in the world. In this course, you'll have theory and pool sessions to teach you the fundamentals of scuba diving and 4 open water dives before you earn your international PADI license. You can also choose to learn the theory at your own pace with the e-learning module which will be sent to you once you book your PADI Open Water Diver course. IMPORTANT: To do this course, you will be expected to know how to swim for 200 meters with any swimming stroke and float for 10 mins in the open water. Known as India's go-to beach destination, Goa has also earned a name for its gorgeous waters and colourful marine life. 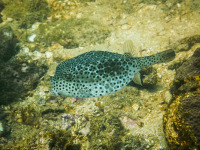 Grande Island is the most popular dive site in Goa, thanks to its good visibility and shoals of colourful fish. If you're lucky, you might even spot a dolphin here! • Become a certified Open Water Diver in 3 days in Goa. • Explore Goa's most gorgeous dive destination at Grande Island. • Earn your international license that lets you dive up to 18 meters/60 feet anywhere in the world. You must adhere to the instructions of the instructor at all times during the PADI Open Water Diver course. Please avoid consuming any food at least half an hour before the dive. 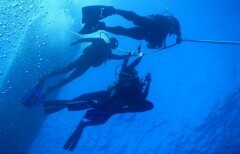 The operator will provide all the necessary equipment for the scuba course in Goa. Participants must use the equipment with care. Avoid catching a flight for 24 hours after your last dive. For cancellations made 14 days or more prior to the start of the PADI Open Water Diver course in Goa: Full refund. For cancellations made 14-7 days prior to the start of the PADI Open Water Diver course in Goa: 75% of the total trip cost will be refunded, minus any transaction charges. For cancellations made 06 days-48 hours prior to the start of the PADI Open Water Diver in Goa: 50% of the total trip cost will be refunded, minus any transaction charges. For cancellations made less than 48 hours before the PADI Open Water Diver in Goa: 25% of the total trip cost will be refunded, minus any transaction charges. There will be no refund of any amount after participants check in for the PADI Open Water Diver course. There will be no refunds for any cancellations done between 24th December to 4th January. Prices for the PADI Open Water Diver (OWD) course in Goa are subject to change without prior notice. 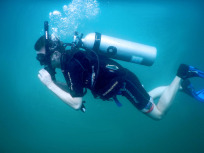 In the event that training for the scuba course in Goa has to be aborted due to reasons beyond the operator's control and/or in the interest of safety of the divers/crew, the liability will be limited to completing the dives at other convenient dates or offering referrals for the remaining portion of the PADI Open Water Diver course that may be conducted by qualified PADI instructors elsewhere. Accommodation options are also available on the property. 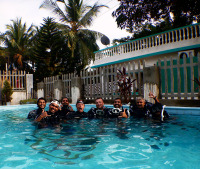 There is no pick up point for this PADI Open Water Diver (OWD) course in Goa. There is no drop off point for this PADI Open Water Diver (OWD) course in Goa. Eat breakfast before you report to the dive centre by 07:30 hrs. On the first day of your PADI OWD course, you'll start with a theory session. After completing the e-learning modules, you'll test the equipment and your newly learned skills in a confined pool. 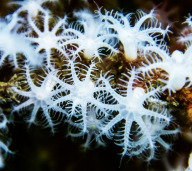 This will help you get comfortable with breathing and navigation underwater. You'll be finished with the day's scuba activities by 16:00 hrs. After breakfast, report to the dive centre by 07:30 hrs. Today you'll undertake 2 dives in the open water. You'll take a boat out to Grande Island, from where you'll try out your dive skills. You'll have to complete some short tasks underwater to earn your OWD license. You'll be dropped off to the dive centre after this, and the rest of the evening can be spent at leisure. Today is your last day, and it's an exciting one! You'll do 2 more dives and a written examination. You'll take the boat to Grande Island and dive to 18 meters/60 feet in the blue sea. You'll have to complete a few tasks underwater and after this, you'll return to the dive centre. You'll have a short written examination before you can fill out your log book and collect your OWD license. Congratulations, you're now a PADI-certified Open Water Diver! Trip ends here. Personal expenses such as soft drinks, packaged water, cigarettes, tips, telephone calls, etc. Goa has an international airport (Dabolim Airport) that is 29 kms away from Panaji. The dive centre is located at Maggie's Haven Boutique Guest House on the Fort Agauda road, behind Stone House restaurant, in the popular tourist destination of Candolim.